Do you always wonder if I have chosen the right power company and have not been over charged? Your questions may be answered here (if you reside in Wellington, New Zealand). 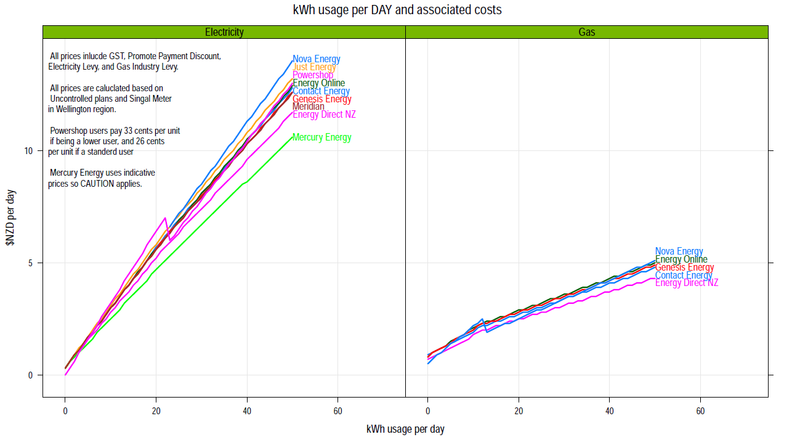 One myth busted for Wellintonians is that Powershop, thought to be the best deal, is actually the 3rd most expensive power company among the other 8 companies, if you use more than 3 kWh per day or 120 kWh per month (average NZer use 7000 kWh per year or 580 kWh per month or 20 kWh per day). 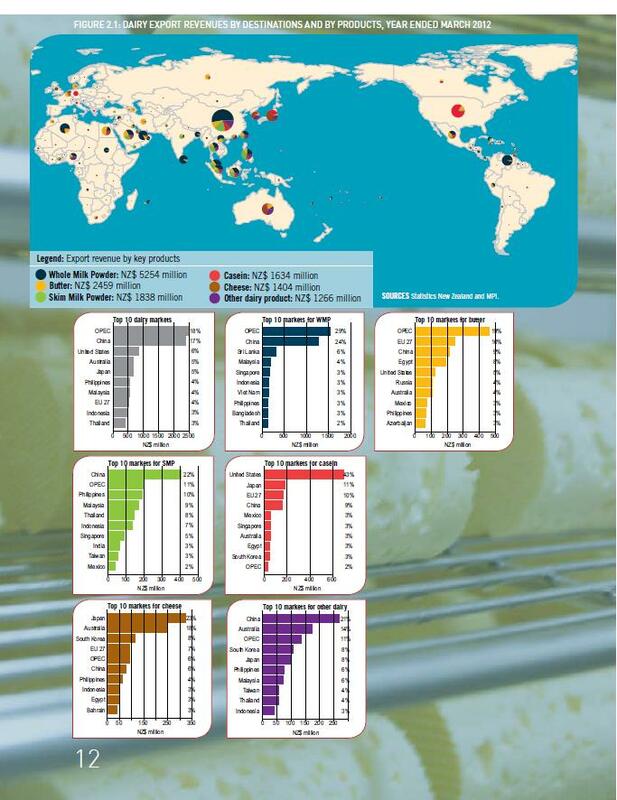 Situation and Outlook for Primary Industries (2012) just published by New Zealand’s Ministry for Primary Industries (click to download page) demonstrates well that R is a limitless tool for analysis and graphing, and the capability of using R is growing in government departments. 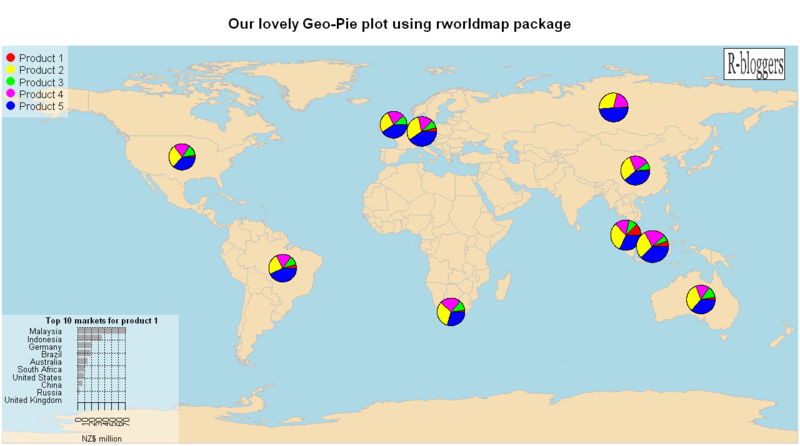 Special thanks to Andy South, whose rworldmap package enables an easy and systematic way to create map-pie charts. Also, Joris Meys’ solution helps to adjust an Atlantic-centered map to Pacific centered map (It would be nice if rworldmap package has Pacific-centered map as an alternative). 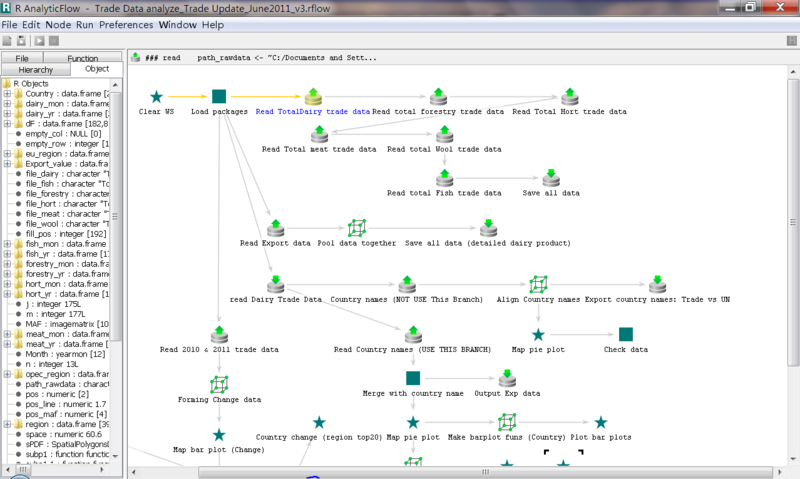 R AnalyticFlow is one of the handiest GUI for R.
Derek McCrae Norton’s presentation in the 2011 useR conference gives an extremely effective way to marketing R in big organizations with long histories. If you would like to build up the presence of R in your organization, please read and follow Derek’s advice. The extra surprise is that our publication team absolutely loves graphs (.eps) produced by R. The reason is simple — they do not need to do anything apart from adjusting graph positions. What they used to do with M$ excel graphs is very onerous — change all color themes, fonts and axis. Of course, this process will come back and forward several times. With R, once these cosmetic things are fixed, what’s left is just mass productions. As an ameturer programmer (one without proper trainings in any mainstream programming language — C and Java) , the more I use R the more I understand the saying — “You are only bounded by your imagination”. The other day I suddenly recalled that someone did a very impressive Facebook map. I then thought it would be nice if I can put these “flows” on the map (or of the same sort) created in my first post. So, I googled around and found this brilliant blog that teaches you how to make flows (Great circles) step by step. 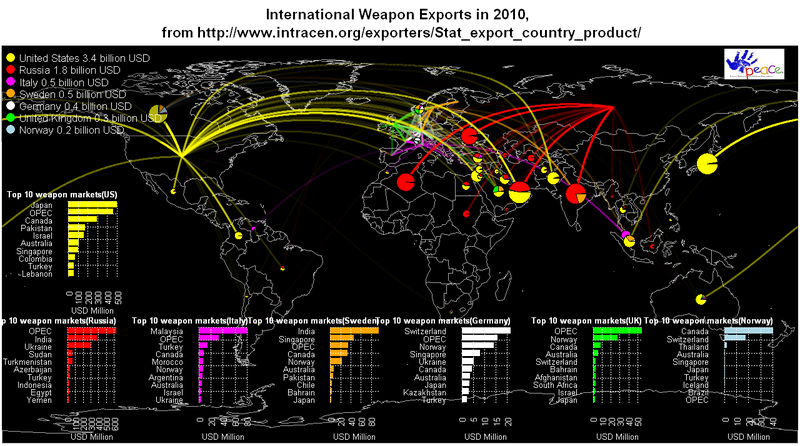 Again, thanks to R, its great community and its openness, I created the following map of international weapon export in 2010 (from top 7 exporters). I hope someone who knows about weapon exports could share some stories with us. But, let’s all pray for PEACE. The “animation” package is great for creating .gif files (of course, it also produces video and flash files thanks to Yihui Xie). By using this package, I would like to show you a nice spot in Wellington, NZ. At this spot, you can see west coast, east coast and South Island at the same time. If you are in NZ for the Rugby World Cup and can spare some time (20 mins bush walk), I highly recommend you to pay a visit. Its address is: -41.234164, 174.779841 on Google Map. Having been using R for 5+ years, visiting www.r-bloggers.com daily, learning cool tricks from it and knowing cool UseRs from it, I finally decide to quit being an observer and start to be a contributor to this wonderful community. In this very first of my blog, I would like to demonstrate how to use a very cool R GUI — RAnalyticFlow and three useful R packages — rworldmap, gregmisc and TeachingDemos to visualize New Zealand primary export data (the data used in this post are freely and publicly available from www.stats.govt.nz). I am not going to details about this GUI but I do encourage you to download and have a play (runs on Mac, Windows and Linux). It is addictive that I must warn you though. A little downside is that it only supports 32-bit R. But the developers are approachable if you want a version that supports 64-bit. “rworldmap” package offers functionality to visualize data on a world map. “mapPies” is fairly flexible function that is suitable for the first job. Forming the data is pretty straightforward, which I will skip here. One thing that I like to point out is that “trim” function from “gregmisc” package is a useful function to eliminate spaces ahead and at the rear of strings (worth to keep in your pocket). To conclude, I’d like to encourage you to give a try on RAnalyticFlow and consider using “rworldmap” package when you have worldwide data to visualize.